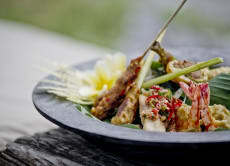 Hi, my name is Mrs Soelastri, and I'm the executive chef at Hotel Tugu Bali. I began my journey into the culinary world with my grandmother when I was just four years old and I really love what I do. My cooking classes are not just about cooking food, but about introducing my guests to Indonesian traditions that date back hundreds of years. Come and join me in Canggu - my little corner of paradise!